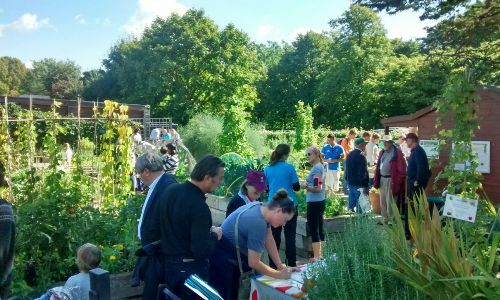 Capital Growth hosts many of its food growing training courses at the Allotment Garden in The Regent's Park. The site is run in partnership with The Royal Parks and Capel Manor College and is managed by our own Julie Riehl, with support from a team of dedicated volunteers. The garden is open from 8:30am-4:00pm every day, including weekends. Information signs are dotted around the garden explaining more about what we do and our growing techniques. The garden is located at the corner of Chester Road and the Inner Circle in The Regent's Park. Click here for a map. We offer a limited number of free curriculum-linked sessions in the garden throughout the year. Please note that there is no covered area, so we are at the mercy of the weather. Get in touch with Julie to find out more and book your a visit with your pupils. For a breath of fresh air, a cup of tea and a chance to meet new people and get your hands dirty, join us for our summer twilight gardening volunteer sessions. Sessions will start Twilight volunteering again in the spring- more info coming soon! Private tours of the garden are available to small groups and can be focused on growing techniques, composting, wormeries use, organic principles, etc. Interested? Email Julie for more information and to schedule a tour.